This video goes through all the steps that were involved in rocking the 11′ X 7′ X 2′ backyard fish pond. Thanks for watching! Thank you for this video! I have a half dug pond in the backyard, that needs to be finished. This video showing the laying of the rocks was very helpful, especially the note to use a metal wheelbarrow! Man, I've waited like a year for this video! Pond looking very good, love your videos. What a nice job on the pond! Looking forward to seeing it with plants. Looking great! It makes me want to do one . Your Kale seed is coming up good ! Thanks again for sharing. Nice I really want to do this. Did you consider using natural clay foundation and cement? 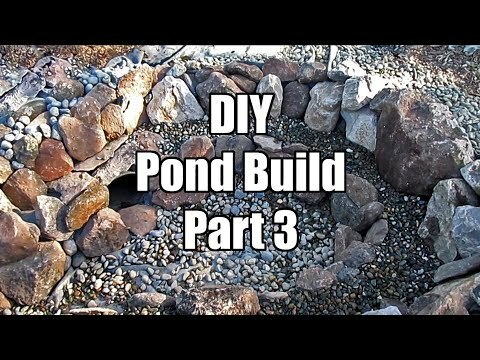 Why did you choose the pond liner vs any other method of building a pond? If this info is in your previous videos Ill make time to go back and watch! Thanks! Love your channel.